Please contact me if you'd like to exchange links. New local business starting in Bexleyheath, calm and caring atmosphere for the dogs. 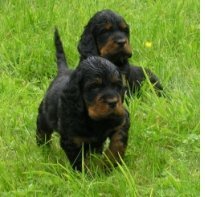 I'm able to groom all breeds, all sizes, clipping, handstripping, ears cleaned, claws clipped, offering bath and cuddles for young pups to get them used to contact and the grooming atmosphere. 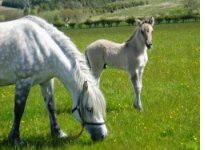 I have completed a Diploma at a Training School based in Somerset. 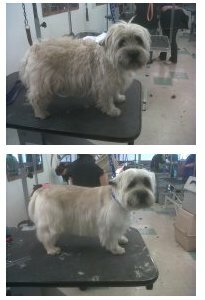 I have gained experience in grooming lots of breeds ranging from the smallest of Terriers to the larger breeds of Standard Poodles and Newfoundlands, an example of some of my work is shown to the left. Introductory offer of half price for first appointments. Please call 07890 108554 for further information or email. Dave and Jacky Mitchell live in the south-east of England with their springers. Their aim is to breed English Springers of show quality with a focus on good health and temperament, retaining the breed’s working ability where possible and striving to produce happy, healthy springers that are a pleasure to own. This website is all about CARERNWIL dogs, G.S.Ds & Cairn Terriers. 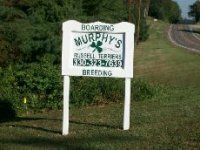 Welcome to Murphy's Russell Terriers! We have raised and loved Jack Russell Terriers for our own enjoyment for almost 17 years, now that retirement is getting close, we plan on spending every minute we can with our "kids" and breeding them. We are located in a small rural farming community in Carroll County, Ohio, USA. We also board.